The Esquadrilha da Fumaça (Smoke Squadron) is the air demonstration team of the Força Aérea Brasileira (Brazilian Air Force). First established in 1952 at the Air Force Academy the team consisted of four T-6 Texan trainers fitted with a smoke system. 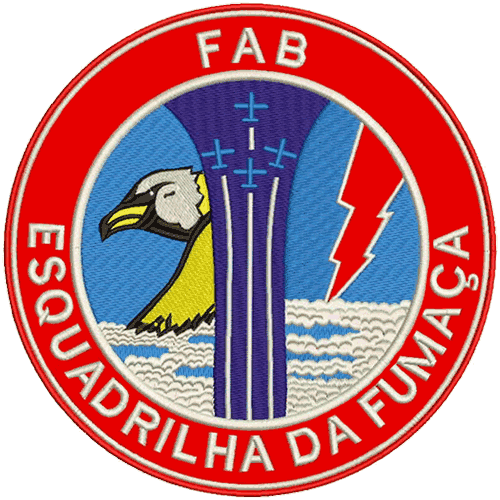 From 1954 onwards the unit became the FAB official demonstration squadron, Esquadrão de Demonstração Aérea - EDA. The Esquadrilha da Fumaça transitioned to the Fouga Magister (T-24 in FAB service) in 1968, but switched back to the T-6 in 1972. In 1977 the unit disbanded, but was re-established in 1983 when the FAB switched to the T-27 Tucano turboprop trainers. Flying seven T-27, the Esquadrilha da Fumaça also flew a number of display overseas, starting in 1997 when it attended the USAF Golden Air Tattoo at Nellis AFB. In 2005 the squadron first displayed in Europe, during a tour in Portugal and France. In 2008 the Esquadrilha da Fumaça made its debut at the Royal International Air Tattoo at RAF Fairford, UK. Finally the Smoke Squadron returned to the USA in 2010 for a brief tour, including the Boston-Portsmouth Air Show 2010 at the former Pease ANGB, NH. In 2012 the Esquadrilha da Fumaça celebrated its 60th anniversary at Pirassununga, SP. 2012 also signaled the end of the team's long history with the T-27 Tucano. The squadron began transitioning to the new domestically produced A-29 Super Tucano later in 2012, completing the process in 2013. The EDA currently has 11 A-29 Super Tucano aircraft of which seven are available for the display flying with four undergoing maintenance at any one time. New pilots and ground crew have joined the team in 2014 while training with the A-29 continues. The Esquadrilha da Fumaça is set to return on the airshow circuit in 2014, at least to display at FAB events and at various domestic shows. Then the team may soon make another overseas tour to promote Embraer's Super Tucano as well.